2 Department of Sport and Recreation, Auckland University of Technology, Auckland, New Zealand. ABSTRACT. Paton, C.D., and W.G. Hopkins. Combining explosive and high-resistance training improves performance in competitive cyclists. J. Strength Cond. Res. 19(4):826–830. 2005.— In several recent studies, athletes experienced substantial gains in sprint and endurance performance when explosive training or high-intensity interval training was added in the noncompetitive phase of a season. Here we report the effect of combining these 2 types of training on performance in the competitive phase. We randomized 18 road cyclists to an experimental (n = 9) or control (n = 9) group for 4–5 weeks of training. The experimental group replaced part of their usual training with twelve 30-minute sessions consisting of 3 sets of explosive single-leg jumps (20 for each leg) alternating with 3 sets of high-resistance cycling sprints (5 X 30 seconds at 60–70 min+/-1 with 30-second recoveries between repetitions). Performance measures, obtained over 2–3 days on a cycle ergometer before and after the intervention, were mean power in a 1- and 4-km time trial, peak power in an in- cremental test, and lactate-profile power and oxygen cost deter- mined from 2 fixed submaximal workloads. The control group showed little mean change in performance. Power output sampled in the training sprints of the experimental group indicated a plateau in the training effect after 8–12 sessions. 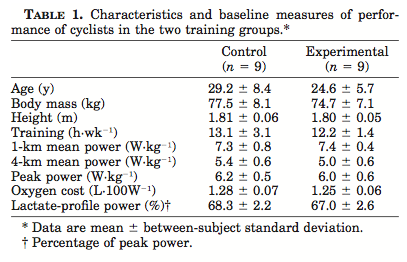 Relative to the control group, the mean changes (±90% confidence limits) in the experimental group were: 1-km power, 8.7% ((+/-2.5%); 4- km power, 8.1% ((±4.1%); peak power, 6.8% ((±3.6); lactate-pro- file power, 3.7% ((±4.8%); and oxygen cost, (±3.0% ((±2.6%). In- dividual responses to the training were apparent only for 4-km and lactate-profile power (standard deviations of 2.5% and 2.8%, respectively). The addition of explosive training and high resistance interval training to the programs of already well-trained cyclists produces major gains in sprint and endurance performance, partly through improvements in exercise efficiency and anaerobic threshold. Sport scientists and coaches use substantial time and resources investigating training methods that may increase the fitness and performance of competitive endurance ath- letes. Two particular training methods that have received considerable attention are high-intensity interval training and resistance training. Most endurance athletes use high-intensity interval training at some point in their programs; however, there is surprisingly little published research into the type of interval training that is most effective. In a study using 5 cycling interval intensities (80–175% of peak aerobic power output) Stepto et al. (16) reported that long duration submaximal intervals and short duration supramaximal intervals gave similar improvements ((±2.6%) in 40- km cycling time trial performance. In a similar study, Laursen et al. (11) found that 3 different interval training routines produced similar increases in mean power (5.3– 6.6%) in a 40-km cycle time trial following 8 training ses- sions. In a further study, Laursen et al. (10) reported increases of 4.7% in peak and ventilatory-threshold power of trained cyclists after completing 4 high-intensity inter- val sessions. Although it is evident that high-intensity interval training is beneficial for endurance athletes, effects of traditional resistance training have been less conclusive. Twelve weeks of traditional lower-body resistance training added to an ongoing endurance training program impaired mean power in a 60-minute time-trial by 1.8% in female cyclists (4). In other studies, explosive-type resistance training appeared to be beneficial. Hoff and co- workers reported that 9 weeks of explosive upper body resistance training increased time to exhaustion in simulated cross-country skiing (6, 7, 13); the gains were equivalent to ±2–5% when converted to changes in mean power using methods of Hopkins et al. (9) Enhancements in 5-km running time of +5% also have been reported following a period of sport-specific explosive resistance training in cross-country runners (14). Replacing a portion of normal endurance training with explosive resistance training also has proved beneficial for competitive cyclists. Bastiaans et al. (2), reported nonsignificant but practically worthwhile improvements of ±3% in 60-minute time-trial performance following 9 weeks of explosive resistance training with well-trained cyclists. Their data also showed an increase in mean power output in a maximal 30-second sprint of 4.2% for the explosively trained group, whereas the control group showed a decrease of ±6%. Though high-intensity and explosive-type resistance training appear to benefit athletic performance when used independently, no one has investigated the effects of combining these 2 types of training. In addition, a concern with all previous studies is that the high-intensity training was performed in noncompetitive phases of the season, when there was little or no high-intensity training otherwise. It is well known that athletes increase the intensity of endurance training to enhance performance in competitive phases of the season. It is therefore unclear from the previous studies whether high-intensity training is worth the effort, because it may produce no extra gain in performance when the athlete is already training hard for competitions. Therefore in the present study, we have evaluated the effects of replacing a portion of normal endurance training with sessions combining explosive and high resistance interval training in the competitive part of the cyclists’ season. The study was a controlled trial in which match-paired subjects were assigned to either an experimental or a control group based on peak power from the pretraining in- cremental exercise test. Subjects performed a set of exercise performance tests in the week before and after a 4- to 5-week training period. Twenty male cyclists with a minimum of 3 years of competitive experience volunteered for this study, which was approved by the institute’s ethics committee. After being informed of any risks associated with participation, each subject gave his written informed consent. The study was performed during the cyclists’ main competitive phase of the season after they had completed 3–5 months of sport-specific base and precompetition training. All cyclists were in a well-trained state and were competing in time trials and road-race cycling competitions at the highest domestic amateur level (New Zealand A grade) on at least 1 occasion per week for the duration of the study. A num- ber of the cyclists had represented New Zealand in international competition. None of the cyclists had participated in a traditional weights-based resistance-training pro- gram in the 6 months prior to the study. Two cyclists failed to complete the study: 1 moved out of the area and 1 had an accident during training. The characteristics and baseline exercise performance of the 18 cyclists who completed the study are shown in Table 1. All cyclists had participated previously in laboratory cycle-ergometer testing and were familiarized with the procedures prior to commencing the study. Cyclists reported to a temperature-control laboratory (20 C) on 2 occasions over a 4-day period to perform an incremental exercise test to determine peak power output, a 4-km time trial, a 2-stage submaximal test to determine oxygen consumption and lactate concentration, and a 1-km time trial. All tests were performed on the cyclist’s own road bicycle mounted to a wind-braked ergometer (Kingcycle Mk3, Kingcycle, High Wycombe, UK), which was calibrated in accordance with the manufacturer’s recommended procedures. An intermittent fault, which resulted in power output fluctuations of several percentage points, was noticed in the first few post tests. When this fault was diagnosed as a malfunctioning temperature sensor in the ergometer interface, we performed all subsequent tests on an older model Kingcycle ergometer (Mk1) without temperature correction. Cyclists were instructed to refrain from hard physical activity for 24 hours and from eating for 3 hours prior to the performance trials. Cyclists initially performed a 5-minute warm-up at a self-selected intensity followed by 5 minutes at a power of 100 W. Thereafter, power output was increased continuously at a rate of 33 W·min-1 until the cyclist reached volitional exhaustion. Peak power output was defined as the highest 60-second mean power output achieved during the test. Twenty minutes after completing the peak power test, cyclists performed a maximal effort 4-km time trial to de- termine mean power output. The test commenced with a 2-minute countdown, during which the cyclists were required to maintain a constant power output of 50 W. Thereafter cyclists were required to complete the time trial as fast as possible. The only information available to the cyclists during the time trial was percentage distance remaining. On the second day of testing and after completing the same warm-up procedure as previously described, cyclists completed a 2-stage submaximal test. Each stage lasted 5 minutes at power outputs equivalent to 60 and 80% of their pretest peak power. During the test, oxygen uptake was continuously measured with a calibrated metabolic cart (Vmax29, SensorMedics, Yorba, CA). Fingertip capillary blood was sampled during the last 15 seconds of each stage and was immediately assayed for whole blood lactate using an automated analyzer (YSI 1500 Sport, Yellow Springs, OH). Two measures of performance were derived from the submaximal test. For each cyclist, the oxygen cost of exercise, expressed as liters of oxygen per 100 W, was calculated for the last minute of each of the 2 stages, then averaged. A measure representing the horizontal shift of the lactate profile was derived as follows. We assumed a log-log relationship between lactate concentration and power output (3). We used the growth function in Microsoft Excel to fit straight lines to the pre- and posttraining lactate plots and derived the percentage shift in the lactate profile using the mean of 5 equidistant segments for the overlapping lactate concentrations between tests. The pre-to-post change in this lactate profile represents the shift in the mean power and is analogous to change in 4- mM lactate-threshold power. We also derived the 4-mM lactate-threshold power from our data, but its error of measurement was substantially larger than that of the lactate-profile power. Twenty minutes after completion of the submaximal test, cyclists performed a maximal effort 1-km time trial to determine mean power output. Procedures for this test were similar to those for the 4-km time trial. All cyclists were requested to keep a record of their weekly training and competition hours for the duration of the study. The control group was instructed to continue with their existing or planned training and competition program. The experimental group continued with their competition program, but replaced part of their usual training with twelve 30-minute sessions of a combination of explosive and high-resistance interval training sets. The experimental training was performed in a controlled laboratory environment under the supervision of a cycling coach. The training sessions were preceded and were followed by a 10-minute warm-up and cool-down at a self- selected intensity. Each session was performed 2–3 times per week, depending upon the cyclist’s availability, and consisted of 3 sets of maximal effort single-leg jumps alternating with 3 sets of maximal intensity cycling efforts. The jump phase of the training required subjects to perform 20 explosive step-ups off of a 40-cm box. The jump efforts were completed for the right and then left leg consecutively, repeated over a 2-minute period. The cycling phase required the cyclist to complete 5 ± 30 seconds maximal intensity cycling efforts at 60–70 min-1 with a 30-second rest between repetitions. A transition period of 2 minutes separated each cycle and jump set. The cycling sets were performed on racing bicycles (Giant Corporation, Taiwan) fitted with power-measuring cranksets (SRMpro, Schoberer-Rad-Messtechnik, Konigskamp, Germany) and attached to magnetically braked cycle ergometers (CS1000, Cateye, Osaka, Japan). The SRM cranksets were set to measure mean power every 2 seconds. Simple group statistics are shown as mean ± between subject SD. Mean effects of training and their 90% confidence limits were estimated with a spreadsheet (8) via the unequal-variances t statistic computed for change scores between pre- and posttests of the 2 groups. Each subject’s change score was expressed as a percentage of baseline score via analysis of log-transformed values, in order to reduce bias arising from nonuniformity of error. Errors of measurement and individual responses ex- pressed as coefficients of variation also were estimated with the spreadsheet. In addition, the spreadsheet com- putes chances that the true effects are substantial when a value for the smallest worthwhile change is entered. We used a value of 1% for the performance measures, because this represents the smallest worthwhile enhancement for cyclists competing in track and time-trial events (15). We also assumed 1% was the smallest worthwhile change in oxygen and lactate-profile power, because a 1% change in these measures would produce a 1% change in endurance performance in the absence of other factors affecting performance. We do not know how a change in body mass would affect cycling performance, so we chose 0.20 standardized units (change in mean divided by the between- subject SD in the pretest) as the smallest worthwhile change (5). The time spent in training/competition during the exper- imental period of the study was 12.9 ± 3.3 h·wk-1 and 11.6 ± 2.1 h·wk-1 for the control and experimental groups, respectively. 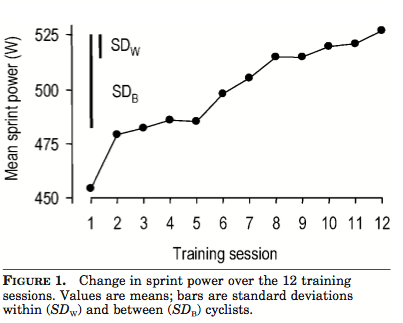 Figure 1 shows the time course of the change in mean 30-second power over each training session. There was a large (±5%) increase in mean 30- second power between the first 2 training sessions. Be- tween training sessions 2 and 12, there was a further 9% increase in 30-second power. Table 2 shows the mean changes in the performance tests and physiological measures for experimental and control groups, and statistics for the difference in the changes. There were clear-cut beneficial effects on all measures of performance in the time trials and the incremental test. Effects on oxygen cost and lactate-profile power were beneficial, but less clear. The effect on body mass was trivial. Standard deviations representing observed individual responses in performance were 1-km mean power, -1.3% (-3.5–3.1%); 4-km mean power, 2.5% (-4.6–6.0%); peak power, -2.7% (-5.2–3.8); lactate-profile power, 2.8% (-5.4–7.0%); and oxygen cost, -1.5% (-3.7–3.0). Any var- iation between individuals, represented by positive SD, was small relative to the mean effect of experimental training shown in Table 2. The uncertainty in both the positive and negative SD allows for, at most, modest in- dividual responses for all the measures, relative to the mean effects. Observed SE of measurement for the experimental measures were 1-km mean power, 2.3%; 4-km mean pow- er, 3.3%; peak power, 3.4%; lactate-profile power, 3.9%; and oxygen cost, 2.4%. The 90% confidence limits for the true errors were X/div 1.55 for all measures. The major finding in this study is that replacing part of normal competitive season training with 12 sessions of high-intensity interval and explosive resistance training produced major gains in laboratory measures of sprint and endurance performance in well-trained cyclists. In relation to the smallest estimated worthwhile effects, the large observed performance enhancements were almost certainly beneficial for cyclists and anecdotally extended to competitions. ing that, when used individually, enhanced performance in previous studies. Several other aspects of our study could account for the greater performance enhancement. The dynamic sets were probably at a lower cadence and higher resistance, although we cannot be certain, because the training cadence was not reported in previous studies. The rest intervals between the individual repetitions (30 seconds) and between the sets (2 minutes) also were gen- erally shorter than those in previous studies (1–5 min- utes). Our study differed from previous studies in several other ways, but if anything, these differences would have reduced the performance enhancement. In particular, ours is the only study performed during the competitive season, when the cyclists were well trained already. The weekly training volume represented by the intervention (20% of the cyclists’ total weekly volume) also was lower than that of most other studies (30–40%). Mean power in the training sprints increased by 14% over the duration of the study. Gains were rapid and occurred mainly in the first 8 sessions. Others have noted rapid gains in performance with high-intensity training (10). Our cyclists appeared to reach a plateau after the eighth session, but the plateau was not well defined, because the cyclists probably made a bigger effort in the last training session. Individual responses to the training were small or negligible relative to the mean response for all measures of performance except lactate-profile power. The confidence limits for the individual responses represent considerable uncertainty in the estimates, but they allow for the possibility that the individual responses for all mea- sures were small. Considering that the training intervention for all cyclists was monitored closely and that all cyclists in the intervention achieved similar training volume and intensity, small individual responses were the expected outcome. The uncertainty in our estimates of individual responses would have been smaller if the SE of measurement of the performance tests had been less. It should be possible to achieve test-retest measurement errors of less than 2%, at least for direct measures of performance power (9). The failure of a temperature gauge on the ergometer (see the Methods section) and the switch to an earlier model ergometer are the likely reasons for the larger than expected error of measurement in our study. However, this larger error had little impact on our inferences for the mean effects, because the performance enhancements were so large. In other studies of high-resistance training, the main and possibly only mechanism for the enhancement in endurance performance is a decrease in the oxygen cost (increase in economy) of exercise (6, 13, 14). In our study, the change in oxygen cost accounts for less than half the increase in power output. The change in oxygen cost also could account entirely for the change we observed in lactate-profile power, which was of similar magnitude. In studies where anaerobic threshold has been measured, the changes also could be attributed to changes in economy (10, 14). However, our uncertainty in the change in lactate-profile power was large, and at the upper confidence limit could account for most of the enhancement in endurance performance. If lactate-profile power does contribute to the performance enhancement over and above the decrease in oxygen cost, there would almost certainly have to be a corresponding increase in maximum oxygen uptake. Indeed, Laursen et al. (11) reported that high-intensity interval training led to substantial increases in maximum oxygen consumption in endurance cyclists. In studies that have used purely explosive-type training, changes in maximum oxygen consumption have been small or negligible (6, 14). We will need to measure maximum oxygen uptake and will need to use a more reliable protocol for lactate-profile power to resolve this issue. Whereas changes in aerobic mechanisms may account for all or some of the increase in performance in the longer duration tests, they cannot account for all of the increase (9%) in the 1-km sprint, which has to be powered partly by anaerobic mechanisms. Adaptations in neural activation of muscle may have contributed to the increase in performance of our cyclists in the sprint. It is possible that the explosive resistance training we used led to increases in firing frequency of muscle motor units (1), thereby increasing muscle peak force and the rate of force development. Indeed, previous authors (2) have reported substantial increases in 30-second sprint power following a period of explosive resistance training. The results of the present investigation show that combining explosive resistance with high-intensity interval training is a highly effective means of enhancing endurance and sprint performance in well-trained competitive cyclists. These enhancements appear to be due partly to increases in exercise efficiency and will presumably be of practical benefit in time trials and in road-race competitions where cyclists are required to complete numerous short-duration, high-intensity efforts (12). Further research is needed to investigate the relative contribution and optimization of the high-resistance and explosive sets to the gains in performance and to clarify the mechanisms responsible. AAGARD, P. Training-induced changes in neural function. Ex- erc. Sport Sci. Rev. 31(2):61–67. 2003. BASTIAANS, J.J., A.B. VAN􏰀 DIEMEN, T. VENEBERG, AND A.E. JEUKENDRUP. The effects of replacing a portion of endurance training by explosive strength training on performance in trained cyclists. Eur. J. Appl. Physiol. 86:79–84. 2001. BEAVER, W., W. KARLMAN, AND B. WHIPP. Improved detection of lactate threshold during exercise using a log-log transfor- mation. J. Appl. Physiol. 59:1936–1940. 1985. BISHOP, D., D.G. JENKINS, L.T. MACKINNON, M. MCENIERY, AND M.F. CAREY. The effects of strength training on endurance performance and muscle characteristics. Med. Sci. Sports Exerc. 31:886–891. 1999. COHEN, J. Statistical Power Analysis for the Behavioral Sciences (2nd ed.). Hillsdale, NJ: Lawrence Erlbaum, 1988. HOFF, J., A. GRAN, AND J. HELGERUD. Maximal strength train- ing improves aerobic endurance performance. Scand. J. Med. Sci. Sports 12:288–295. 2002. HOFF, J., J. HELGERUD, AND U. WISLOFF. Maximal strength training improves work economy in trained female cross-coun- try skiers. Med. Sci. Sports Exerc. 31:870–877. 1999. HOPKINS, W.G. Probabilities of clinical or practical signifi- cance. Sportscience [serial online]. 2002;6. Available from: http: //sportsci.org/jour/0201/wghprob.htm. Accessed August 2, 2005. HOPKINS, W.G., E.J. SCHABORT, AND J.A. HAWLEY. Reliability of power in physical performance tests. Sports Med. 31:211– 234. 2001. LAURSEN, P.B., M.A. BLANCHARD, AND D.G. JENKINS. Acute high-intensity interval training improves Tvent and peak pow- er output in highly trained males. Can. J. Appl. Physiol. 27: 336–348. 2002. LAURSEN, P.B., C.M. SHING, J.M. PEAKE, J.S. COOMBES, AND D.G. JENKINS. Interval training program optimization in highly trained endurance cyclists. Med. Sci. Sports Exerc. 34:1801– 1807. 2002. MARTIN, D.T., B. MCLEAN, C. TREWIN, H. LEE, J. VICTOR, AND A.G. HAHN. Physiological characteristics of nationally compet- itive female road cyclists and demands of competition. Sports Med. 31:469–477. 2001. OSTERAS, H., J. HELGERUD, AND J. HOFF. Maximal strength- training effects on force-velocity and force-power relationships explain increases in aerobic performance in humans. Eur. J. Appl. Physiol. 88:255–263. 2002. PAAVOLAINEN, L., K. HAKKINEN, I. HAMALAINEN, A. NUMMELA, AND H. RUSKO. Explosive-strength training improves 5-km running time by improving running economy and muscle pow- er. J. Appl. Physiol. 86:1527–1533. 1999. PATON, C.D., AND W.G. HOPKINS. Tests of cycling performance. Sports Med. 31:489–496. 2001. STEPTO, N.K., J.A. HAWLEY, S.C. DENNIS, AND W.G. HOPKINS. Effects of different interval-training programs on cycling time- trial performance. Med. Sci. Sports Exerc. 31:736–741. 1999. This research was conducted at the Waikato Institute of Technology, Hamilton, New Zealand. Address correspondence to Carl D.Paton, carl.paton@ wintec.ac.nz. This entry was posted in Reviews, Training and tagged Cycling Endurance exercise engineering Fatigue Profiling Heart Rate Monthly Testing Protocol Orthostatic Heart Rates Power sports and exercise engineering sports engineering Sports Exercise Engineerin, High resistance training, Sports Exercise Engineering, Strength Training, strength training for cyclists, VO2 Max. Bookmark the permalink.